I watch Shark Tank every week, and I learn a lot from the questions asked by the investors and the innovative approaches taken by entrepreneurs. But it’s exceptionally rare that I actually buy something I learn about on the show. Today was an exception to that rule. I love products and services that save me time and convenience (without being outrageously priced). 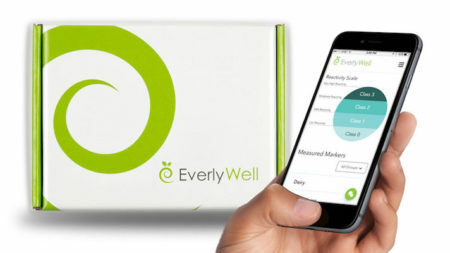 So when I heard the pitch for Everlywell, a service that allows you to gather lab test samples at home and mail them for testing and physician review, I was really intrigued. Here’s why I like it: I’ve been trying to go to the doctor every year. And I’ll continue to do that. But usually I go to the doctor, get my checkup, and then he tells me to come back on a different day for a lab test. Usually this means driving first thing in the morning the the doctor’s office on an empty stomach to have my blood drawn for 5 minutes. There’s a lot of unnecessary time involved. So I’ve decided to give Everlywell a chance. I just ordered the cholesterol test for $79, and it’ll be delivered to me in a day or so. I’ll give myself a finger prick (which I’m not excited about, but it’s a small price to pay), complete the sample, and mail it back. Within a few days I’ll have my results. I think it’s pretty cool. When I completed my order, Everlywell sent me a promo code to share, so if you want to give it a try, feel free to use this link to get a discount. There are over 20 tests to choose from. I’ll blog about it here after I use the kit, and I’ll let you know what I think! How do you feel about taking this kind of test at home? Is it worth the convenience to you? This entry was posted on Thursday, December 7th, 2017 at 9:21 pm	and is filed under ideas, technology and tagged with ideas, technology. You can follow any responses to this entry through the RSS 2.0 feed. I think it’s especially ideal if one is as much as possible a Do-it-yourselfer regarding medical diagnoses, which I am. (That’s fortunate, because where I live the wait to see a physician who takes Medicare is impractically long—e.g., more than six months for any dermatologist, even if you are an existing patient, and over a year for my excellent ophthalmologist; plus many primary care physicians aren’t taking new patients.) Besides convenient access to needed information, such at-home tests avoid the increasingly frequent experience of 30 minute (or more) waits in patient rooms, confronted with videos advertising whatever procedures the doctor offers! Dorothy: That’s a great point–the inconvenience goes well beyond just going to the doctor, as it extends to even just having a doctor available in a timely manner. I believe that this prodcuct, along with the those on offer to asertain your heritage profile (e.g. 23 and Me) is definitely on the rise and given the crushing demands on our current medical system, coupled with the fact that, according to a Foreign Affairs article frmo a few years ago, we’ll need in excess of another 100K doctors and more than three times that number of nurses and medical professionals by 2050. To that end, if we can, in a responsible manner, outsource lab tests to competent technicians, we should absolutely do so and reserve our low-density medical professionals for more pressing matters. Joe: Wow, that’s a frightening stat! Hopefully services like this will help. My doctor also asks for lab work on a regular basis. Assuming there is nothing currently wrong with me and it’s just an annual wellness visit, I have him put in for the lab work the week before the appointment. Then I stop by whenever I’m in the area one morning and have some time. Might be worth considering. In my case the doctor and lab are within walking distance from my house so I just stop by one morning on the way to work. That sounds very convenient! I wish I had a doctor within walking distance.